Following our recent test of the new additions to the Radeon line-up of graphics cards, the HD6850 and HD6870, we wondered amongst the team how well they performed relative to the similar offerings from the nVidia stable, the GTX460s. Feedback we gained from our forums and our Youtube showed that we weren't the only people who were curious as to which would provide the best level of price to performance, and so a plan was hatched. HIS Digital kindly agreed to provide us with a pair of their HD6850s and HD6870s to allow us to fulfil the Red Team side of the test. We saw recently how they performed as a singlet, so we're looking forward to seeing how they do in Crossfire. On the other side of our metaphorical garage we have two variants of the GTX460 courtesy of EVGA. 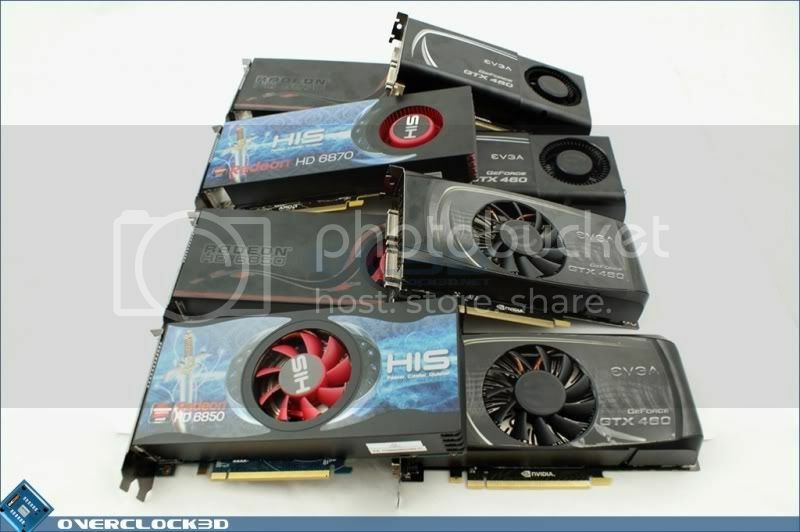 The GTX460 768MB and GTX460 1GB. Discussions about how much memory you need on board your graphics card have raged for a long time so it will be yet another thing we can hopefully find the answer to. EVGA need a lot of praise here for two factors. Firstly for the speed in which they provided the cards for our test. Rather than the normal ask and wait procedure they were only too happy to send them and got them to us overnight. Secondly we felt it was important to test the most basic reference models we could, so whilst they were happy to send us flashier cards with custom cooling they nonetheless provided us with reference models as we asked. A tip of the hat to EVGA. Finally we needed to work out what we would test them using. Because so many games provide similar performance levels or are just a rehash of the same game engine we always tend to limit our testing to a select handful of games. However if we really wanted to find the best value answer to your gaming needs we wanted to put them through the wringer. So today we're testing 8 different games that highlight various aspects from pure frame-rate burners, via PhysX heavy efforts, to games so new we've only got a benchmark. Naturally with 8 cards to be tested at both stock and overclocked settings it was too much of a task for just one man, and so once again myself and Tom have teamed up [editors note: like Hanibal & Murdock] to ensure we can give you a thorough review without you having to wait a month for it to arrive. Unlike some other sites where having a pathetic text based on page 'shoot out' is deemed acceptable rather than testing them both side by side and having all the data to back up their views or maybe even half the story. OC3D now bring you all the latest midrange GPU's and all the best games to one place with all the tests you could possibly need.